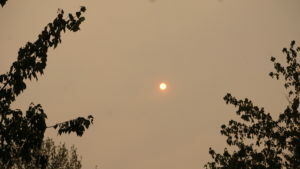 The Seattle area is inundated with smoke from wildfires burning in British Columbia, Oregon, California, and around the state of Washington. According to Washington State Department of Ecology, the smoke in Seattle and King County is causing unhealthy air quality. Smoky air conditions not only cause unsafe breathing conditions, but can also cause unsafe driving conditions that lead to car accidents and injuries. Turn your lights on low beam. Much like driving in fog, high beams will reflect off the smoke and potentially impair your ability to see. Turning your lights on low beam will not only help you see, but also help other drivers, bicyclists and pedestrians see you which decreases the likelihood of a car accident. Keep your windshield clean. Use wipers and windshield washer fluid liberally to ensure that your visibility is maintained. Slow down. When smoke causes driving conditions with reduced visibility, it’s important to slow down. Speed is a major cause of car accidents that happen in smoke-related collisions. Avoid passing and changing lanes. Patience is vital for driving in limited visibility conditions caused by smoke, fog, snow or heavy rain. If smoke causes severely limited visibility, use the right edge of the road or painted road markings as guides. Do not stop on a freeway or congested roadway as doing so can cause a multi-car pileup. If you have to pull to the side of the road, be sure to you use your turn signal and gradually slow and carefully pull off of the road. Don’t forget to use your hazard lights once you’ve pulled over to the side and stopped. Protect your lungs. Roll up all windows and recirculate air in your car rather than bringing in the smoke filled air from outside. Most vehicles allow occupants to re-circulate air from inside the vehicle cabin which can help reduce smoke particles. Once the smoky conditions cease, replace your vehicle’s air cabin filter. Be overly cautious when crossing roads. Take the extra few seconds necessary to ensure that no vehicles are approaching, or that drivers are not only aware of your presence but are also slowing or stopping to let you cross. Where reflective gear and lights. Bicyclists should be certain to have an activated headlight and an activated rear light to ensure that drivers approaching from all directions see the bicycle. Pedestrians can also benefit from wearing clothing, shoes and backpacks with reflective material. In addition, pedestrians can attach lights to increase their visibility. Cyclists and pedestrians should check local air quality reports and listen to news or health warnings because spending long periods of time in smoke filled air or exercising in smoky conditions can be harmful to lungs. Cyclists and pedestrians can wear certain types of face masks to provide protection, including respirator masks labeled N95 or N100. For more information on the legal steps to take following an accident, contact Colburn Law today.